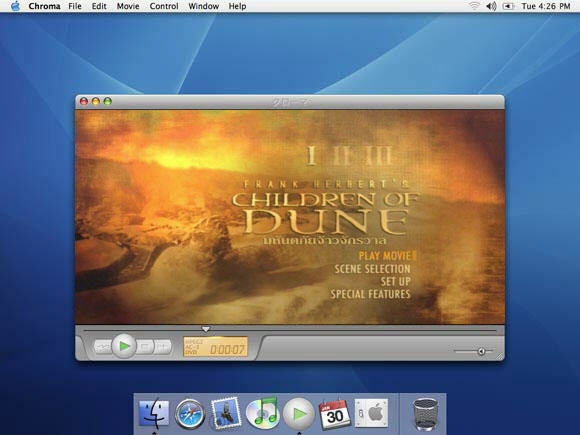 A Mac movie player which can play DVD, QuickTime, DivX™ AVI's, XviD, Matroska and Windows Media files. Chroma Player for Mac is a movie player for Mac optimized for playing feature movies. It plays DVD, QuickTime, DivX™ AVI's, XviD, Matroska and Windows Media files. Chroma Player for Mac is a Mac movie player which can play DVD, QuickTime, DivX™ AVI's, XviD, Matroska and Windows Media files. iSquint - An iPod video conversion app for Mac OS X. It's many times faster than QuickTime Pro, works with almost all popular video formats, and it's infinitely free-er. SWF & FLV Player for Mac - A free, swift and smart Flash player for Mac OS with clean interface and absolute control of Flash movies. AppleMacSoft DRM Converter for Mac - Convert all of your DRM music files to standard format files (MP3, AAC, Apple Lossless, AIFF, WAV).